Home Features John Terry: Captain. Leader. Legend. John Terry: Captain. Leader. Legend. There is no greater love affair in football, than John Terry and Chelsea Football Club. The Englishman is deeply rooted in the ethos of the organization. Talented footballers come along every so often and while we respect them, the sport as a whole has become saturated with them. Players like John Terry are cut from a different cloth. While boasting skill that surmounts those ordinarily talented footballers, it’s his charismatic nature that fascinates Chelsea fans. When searching for an icon to represent all of Chelsea FC, no one looks beyond Terry. He is the face of the club and all that it stands for. These are sentiments that he echoed in his farewell speech to Chelsea fans at Sunday’s match. The fact that he chose to pay tribute to Steve Holland, Chelsea’s assistant coach and a huge part of their success since 2009, speaks to Terry’s professionalism and character. Then, the Englishman went on to thank Abramovich, the man who has been the driving force behind much of Chelsea’s success during his time at the club. Terry knows that when Abramovich took the reigns in 2003, Terry could have been shipped out like many players at the time. His shoes would have likely been filled by an expensive replacement and the storied career we are celebrating now would likely have been fiction. However, Abramovich, along with the confidence of the manager at the time, Claudio Ranieri, ensured that Chelsea fans would have Terry at the helm for years to come. By paying respect to the Blues owner, Terry illustrated that he knows that he has had his success because the Russian has supported him. To recognize that fact in his farewell speech is pure class. So when we consider Terry’s career and look at his accomplishments, we must remember we are saying good bye to not just a legend on the pitch, but a man that represents everything the club stands for. The hope of every Chelsea fan is to see John Terry managing the Blues one day. I echo these hopes as I believe the Englishman will be a brilliant manager after the proper licensing and managerial experience. For now, all we can hope for is to not see Terry in a rival uniform. Regardless of where the next stage of his career takes him, there’s no doubt he has cemented his status in Chelsea history. Captain. Leader. Legend. 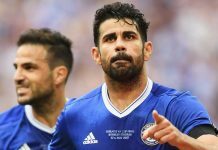 Next articleIs this the beginning of something special at Chelsea?